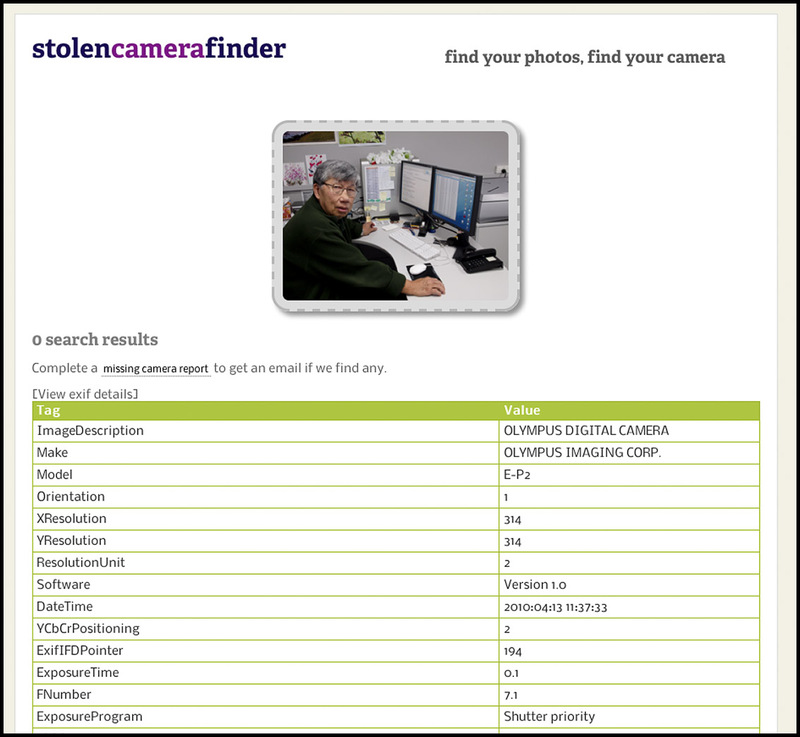 Man Behind Lens: Stolen Camera Finder !!?? I came across this interesting site today! 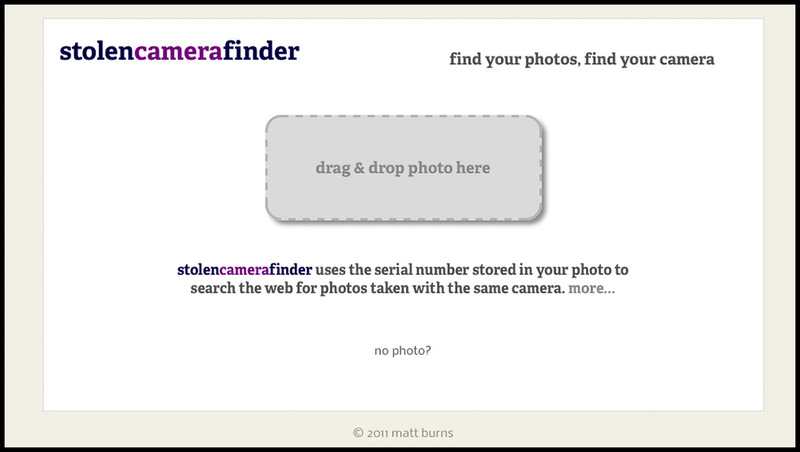 This programmer by the name of Matt Burns has written a search engine that lets people find their stolen camera!! 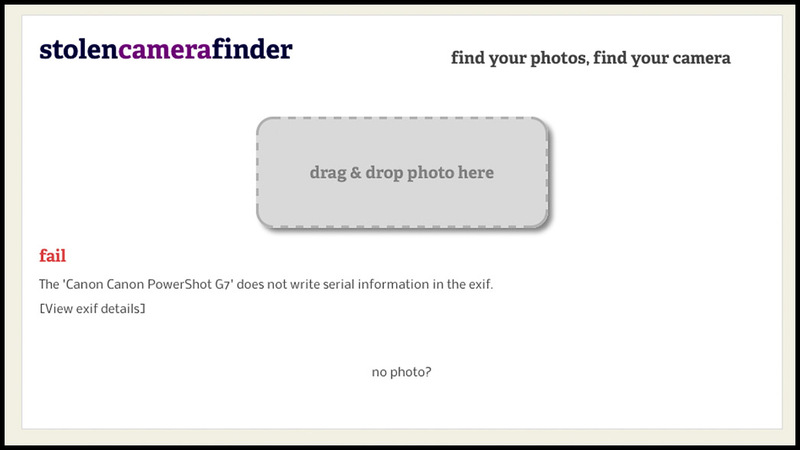 I learn that your digital photo's EXIF data actually have your camera's serial number embedded in it! Exif was created by the Japan Electronic Industries Development Association (JEIDA). Version 2.1 of the specification is dated June 12, 1998, and the latest, version 2.3 dated April 2010, was jointly formulated by JEITA and CIPA. Though the specification is not currently maintained by any industry or standards organization, its use by camera manufacturers is nearly universal. This is what the web site look like. You can enter your camera’s serial number or just drag and drop any photo taken with your stolen camera into the gray box to get a list of web pages that contain images taken with the same camera! It is free and sound easy! I decided to give it a try! 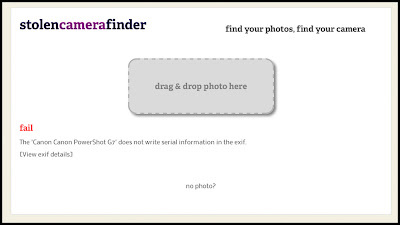 Mind you, I do not have any of my camera stolen; but if I drag one of my digital photo in the box, it will tell me where that picture is published; right? First attempt, FAILED! You need an UNEDITED original image! This time I was told Canon G7 does NOT write serial number in their EXIF ! I suppose ALL the G series don't either! Bingo! That is a picture of me at my work station, taken by Nigel with my E-P2! The serial number is shown, but for security; not shown here... duh! The camera IS NOT STOLEN! You will have to fill out this form and wait for result! Personally, I feel a bit uneasy on this really; so it is your choice. 1. Only SOME digital cameras write their serial number in their EXIF data. 2. The site is NOT secure, giving out your infos are a risks. 3. 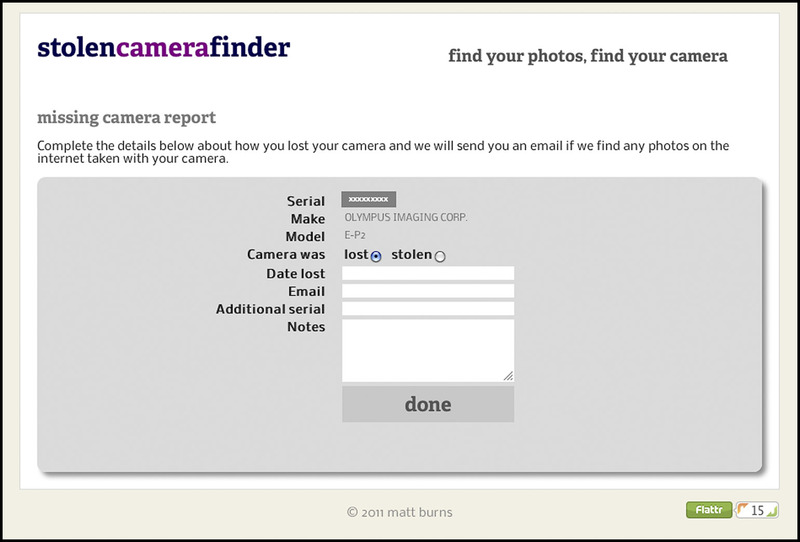 If the thief do not post pictures taken with your camera, this amazing site will return a "not found". Nice CY - saved me doing some further research... the unease I have is the one you have identified - giving out your details after the tempter... maybe I'll set up a temp gmail a/c? Noting your point about the images being "originals" could also be an issue... with camera's typically hitting 6-10Mb who's going to post images that size on the web without compressing or downsizing first?! Result = less chance finding a metadata match. Thanks for the write up. 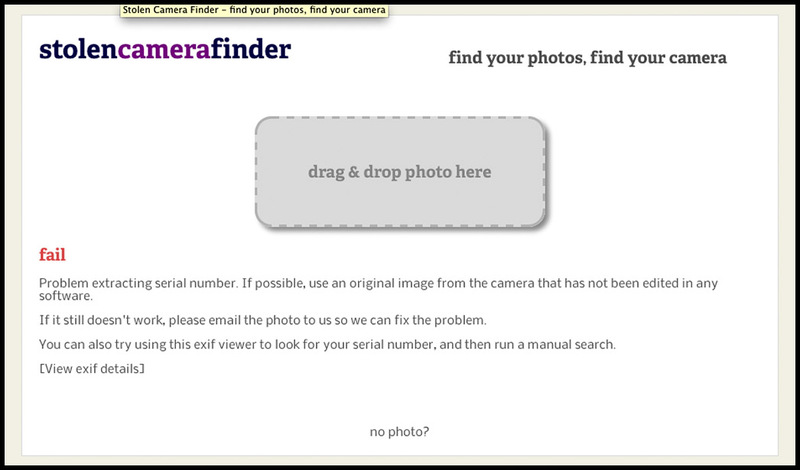 I wrote stolen camera finder and am always looking for ways to improve the site. I ask for "Original" images because some image processing software effectively corrupts part of the exif data. Some software does not corrupt it and so isn't a problem. 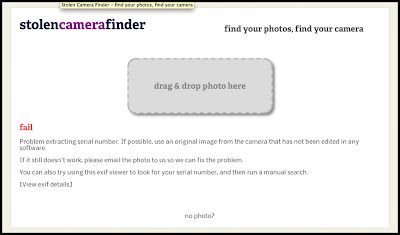 Entering your details in a missing camera report is purely optional and not required to perform a search. You simple had 0 search results on the previous page. 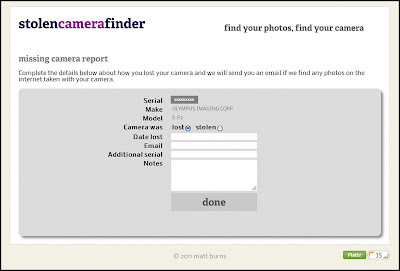 The report is just a way for me to contact you should my web crawlers discover your missing camera being used on the internet. You mention concerns about security. Would you prefer if I secured the page with https?